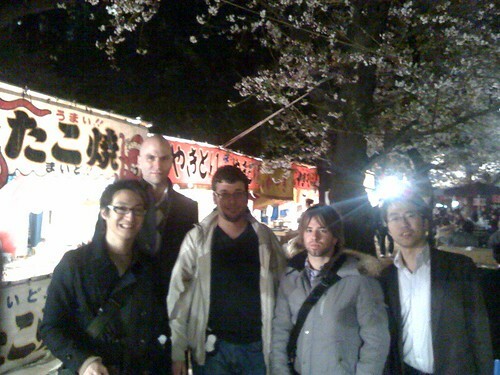 Andrew Shuttleworth and Paul Papadimitriou organized an event cerebrating cherry blossom in bloom, Extreme Hanami and was crawling five spots in Tokyo. Participants were walking and feeling the atmosphere, and reporting it on Flickr and qik. At final phase of the event, I joined the team at Yasukuni Shrine. Feel a little bit cold and rainy. I wish we could get off more and there could be many Hanami event here and there. You can check out the event at Extreme Hanami. I got an e-mail announcing an event from Andrew Shuttleworth or tokyo2point0’s organizer. He hosts a seminar in Shibuya for those who are interested in launching tech start-up. Dave McClure, who is an advisor for several web2.0 start-ups and an angel investor at Founders Fund, will have a lecture there. Simultaneous interpretation to Japanese available. Admission fee is 10,000 yen. Unfortunately I cannot be there to listen in, because I’m drawing at a work in the year-end. Even U.S. big three autos are getting harder to survive in these days, however, anyone who starts something new would be admired in any day. Defeat recession, and I wish more Internet start-ups would be born in 2009 as well. I visited Cerego Japan’s office in Shibuya, and Mr. Andrew Shuttleworth, co-organizer of a Tokyo-based monthly event “tokyo2point0”, introduced me to Mr. Andrew Smith Lewis, founder of the company. When Cerego Japan released an application called “BrainSpeed” around the beginning of this year, I covered a story about their language learning site “iKnow!” in my serial column of Fuji Sankei Business-i Newspaper. But this time, I got so impressed with a new style of learning languages one another by the contents created by the users themselves, and the new type of advertising based business model that I’ve never heard of. Cerego Japan won an award called “DEMOgods” at a tech conference “DEMO”, which was held in the 2nd week of last month, I could not witness it because I was in San Francisco to attend Tech Crunch 50. I’m looking forward to iKnow’s new features coming soon. CNET Japan covers iKnow! and Cerego Japan in detail.